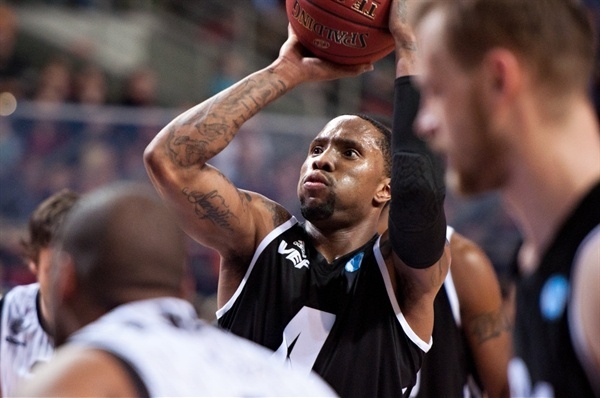 VEF Riga sent a message that echoed all around the Eurocup Last 16 by downing Uxue Bilbao Basket 99-76 in Group J on Tuesday. VEF improved to 1-1 in Group J and Bilbao dropped to 0-2. E.J. Rowland paced the winners with 30 points on 8-of-11 two-point shots and 4-of-5 shots from beyond the arc. He had 23 points after the break in an outstanding second-half exhibition. 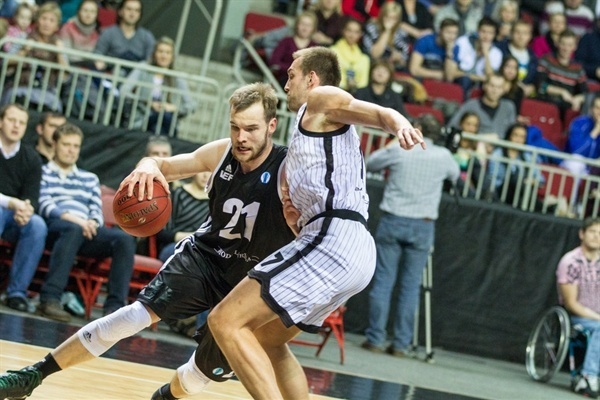 Gatis Jahovics added 16, Donatas Zavackas had 11 while Kristaps Janicenoks got 10 for VEF. Kostas Vasileiadis led 5 Bilbao players in double digits with 20 points. Raul Lopez added 15, Alex Mumbru and Lamont Hamilton each had 13 and Roger Grimau got 10 for the guests. VEF opened the game with an 8-0 run but Bilbao quickly bounced back to get its first lead, 9-10. Jahovics and Rowland allowed VEF to get a 25-21 lead after 10 minutes. 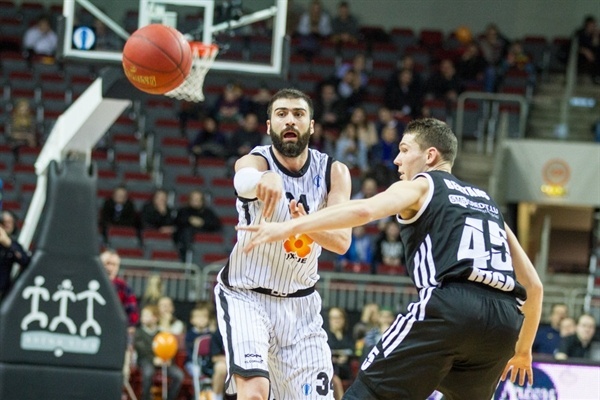 VEF led all the way in the second quarter and Antanas Kavaliauskas gave VEF a nine-point lead, 50-41, near halftime. Bilbao used a 0-10 run that bridged between both halves to regain a 50-51 lead after the break. VEF found a go-to guy in Rowland, who got some help from Bertans and Jahovics to make it a 14-point game, 75-61, after 30 minutes. An outstanding Rowland allowed the hosts to seal the win, 86-66, with under 6 minutes left, giving all VEF fans plenty of time to celebrate a big win. Kavaliauskas got VEF going with an easy basket and Kaspars Berzins added back-to-back triples for an 8-0 lead. Mumbru answered from downtown and added a put-back basket in a 1-10 Bilbao run that gave the guests their first lead, 9-10. Janicenoks and Hamilton traded baskets, Will Daniels found his first points and a layup by Mumbru restored a 13-15 Bilbao edge. Janicenoks buried a triple and Jahovics added 5 unanswered points but Vasileiadis and Lopez kept Bilbao within 21-19. Dairis Bertans downed a jumper and Rowland matched Lopez's free throws with a layup that fixed the score at 25-21 after 10 minutes. Kavaliauskas scored in the low post early in the second quarter and got some help from Daniels and Rowland to make it an eight-point game, 31-23. Grimau hit a turnaround shot, igniting a 0-6 run that Vasileadis capped with a running jumper. Lauris Blaus scored down low but Grimau took over with an acrobatic basket and Vasileadis struck from downtown for a 35-34 score. Zavackas joined the three-point shootout, Bertans added a driving layup and a tip-in by Jahovics boosted the hosts' lead to 42-36. Vasileiadis and Zavackas traded triples and even when Lopez scored again, Rowland and Kavaliauskas gave VEF a 50-41 margin. 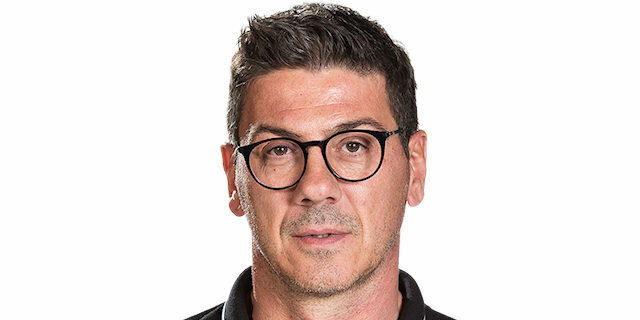 A buzzer-beating triple by Vasileiadis kept Bilbao within 50-44 at halftime. Hamilton banked in a turnaround shot right after the break, igniting a 0-7 run that Mumbru capped with a corner triple for a 50-51 Bilbao edge. VEF did not panic, however, as Rowland and Jahovics fueled a 6-0 run that put the hosts back ahead, 57-51. Mumbru scored in the low post but Rowland quickly bettered that with a three-pointer. Vasileiadis answered from downtown, Rowland scored again and free throws by Jahovics restored a 64-56 VEF lead. Lopez swished a close shot but Bertans and Rowland led a 5-0 VEF run that made it a double-digit game, 69-58. Hamilton rescued Bilbao with a three-point play but Janicenoks and Rowland shined with back-to-back triples for a 75-61 VEF margin after 30 minutes. Grimau hit a floating jumper early in the fourth quarter that a red hot Rowland followed another shot from downtown with a fast break dunk that broke the game open, 80-63, with 8 minutes left. Janicenoks scored around the basket, Hamilton did better with a three-point play but back-to-back baskets by Rowland and Kavaliauskas sealed the outcome, 86-66, midway through the fourth quarter. Bilbao did not give up, as Vasileiadis and Lopez fueled an 0-6 run to get the guests a bit closer, 89-73. By the time Rowland took over with an another off-balance three-pointer, however, everything was said and done already, as VEF had cruised to a big win. "First of all, I will like to congratulate all VEF fans. We played really well and did that as team at both ends. Playing as a team was one of the biggest keys to this game. We have to rest and get ready for the next games. All the important games are still ahead of us." 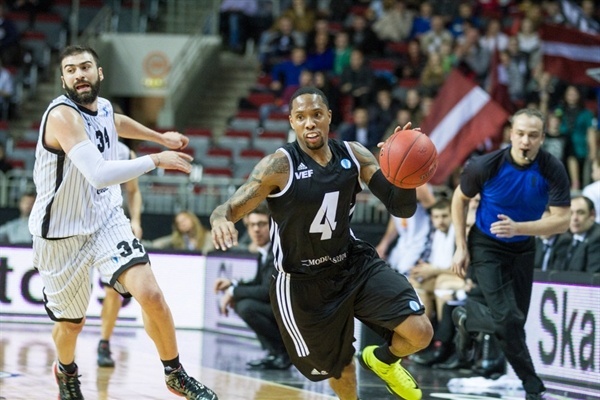 "Congratulations to VEF Riga. They were much better than us and deserved to win. Their three-point shooting percentage was a big factor in this game. E.J. Rowland made a huge difference with all the shots he made." "It is always nice to get a win against a strong opponent and do it so convincingly as we did tonight. We won because of our offense, which was good throughout the whole game. We also improved our defense in the second half, which led us to this great win."